Cracking the case won't be easy. She'll need help from her pastry-baking best friend, Samantha; her wisecracking Granny Annie; and her trusty West Highland Terrier, Shamus. A Cupcake of a Cozy! With a Cherry On Top! Would you consider the audio edition of Daisy McDare and the Deadly Legal Affair to be better than the print version? Yes, definitely, Caroline Shively absolutely MAKES this series for me. She is a cozy readers dream narrator, fun, vibrant, up beat, clear.... her voice makes me happy. 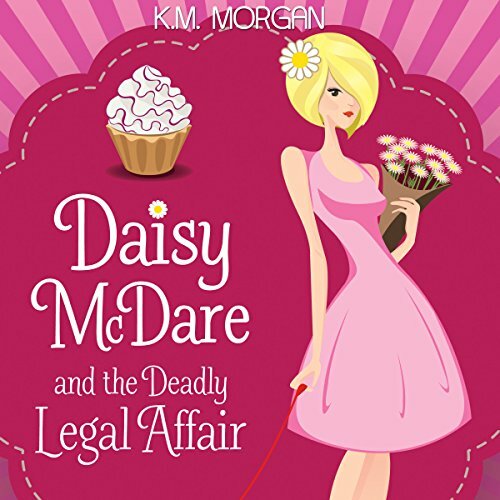 What other book might you compare Daisy McDare and the Deadly Legal Affair to and why? Well, I also listened to the first one, and it had many of the same characters as this one. Since the narrator, Caroline Shively, was the same, it made me happy too, but not as happy as the second one. K.M. Morgan is getting more skillful as she writes this series. What does Caroline Shively bring to the story that you wouldn’t experience if you just read the book? Oh just about everything, lol. Her personification of Daisy and the other characters is wonderful. But it is her lighthearted take on what is essentially entertainment reading that makes this series a keeper. I only want to be amused when I read a cozy, to have a fun happy experience, to visit a world where stress is at a minimum. Caroline creates that world with her voice. I liked it very much when a character's comment triggered a chain reaction in Daisy's mind and suddenly she knew "who done it". Daisy has her faults, she's not perfect, but she's one smart cookie! I was given this audio copy for review, but I bought the print version too so I could read along. I was afraid I might not be able to focus adequately to review the book otherwise, but for book three I don't even think the written version will be needed, Caroline is so easy to follow along with. Would you try another book from K.M. Morgan and/or Caroline Shively? The Daisy McDare series is about Daisy, an intereior designer who happens to get involved in a light murder mystery when her client is killed. The story also involves her bestie, who is a baker, and an on-off boyfriend. It's the classic cozy mystery, and delivers a solid story. I gave the story only 3 stars because the overt gender typing was unnerving. Is KM Morgan a man? Caroline Shively has a pleasant voice and did a great job of differentiating characters. Did Daisy McDare and the Deadly Legal Affair inspire you to do anything? Sure! It inspired me to cook! Love the description of baked goods in this series! I received this book directly from the author in exchange for an honest review.